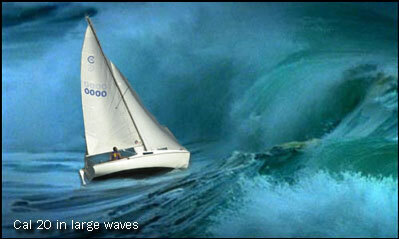 Extreme sailing is the toughest, most physically demanding and mental wearing down experience a person could ever do. Many things in sailing can be extreme such as sailing around the world, sailing across the Atlantic and so on, but these are usually done by yachts. What do I mean by extreme sailing in a dinghy sense? Well usually it includes people who are absolutely mad about sailing, taking an optimist out in a Force 6 or a Laser One out in a Violent Storm (Force 11). This type of sailing is for those adrenaline seeking maniacs who want the maximum thrill that sailing can give them, but it is also great to watch and read about for us 'normal people'! The extreme high end of sailing boats and the best performing high tech sailing vessel, makes this boat the choice of only Olympians and crazy adrenaline seekers. However, this article tries to explain why it would be very wrong for a beginner to get behind the tiller in this boat, without being prepared for a thrill they will never have experienced before! Amazing for those people looking for the ultimate adrenaline rush as you go more than twice the wind speed - above the water! If you thought you could never fly with a sail on, you were wrong! Check out the most incredible thing you have ever seen in your life: a boat, that can fly! When you think sailing boat, you think of water right? Wrong! As we have seen above, it is possible for a boat to sail on air, so why not the other state of water? Ice! And with ice's physical properties such as low frictional resistance, drag is a thing of the past in ice sailing!